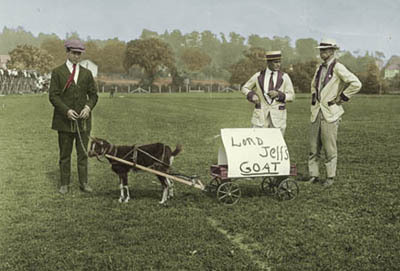 Goat cart at football game vs. The University Archives contains the official and unofficial records of the University of Massachusetts Amherst throughout its evolution from a small agricultural college into a dynamic and complex university. Within the archives are letters and artifacts, records, photographs, and sound recordings documenting the lives of its founders, the pursuits of its faculty, and the changing attitudes of its students and alumni, revealing what high quality public education means to our Commonwealth and nation. Among the hundreds of discrete collections and over 13,000 linear feet of records are the official papers of Chancellors, Presidents, Trustees, and other administrators; information about the University’s academic units and student organizations; and the founding documents of our sister campuses at Worcester, Boston, Lowell, and Dartmouth. The papers of faculty members add a wealth of information about the lives and intellectual pursuits of our campus community as well as their chosen academic disciplines. A comprehensive alphabetical index of UMass departments, programs, and other units, including acronyms. Each entry includes a reference to the archival Record Group where the records can be found. YouMass is wiki devoted to the life and history of the campus community.